Russian petroleum company Rosneft, Gazprombank & Sovcomflot and Korean shipbuilding company Daewoo Shipbuilding & Marine Engineering have signed an agreement to establish a shipbuilding and industrial cluster in the Russian Far East. The parties say they’ve agreed to jointly complete the construction and launch the new shipyard and shipbuilding complex in 2016 in the southern part of Primorskiy Krai. The contract was signed in the presence of Russian President Vladimir Putin and Park Geun-hye, the President of the Republic of Korea, as part of an official visit by Putin to the Republic of Korea. The companies say they plan to establish a Russian-Korean engineering center for shipbuilding and marine equipment for offshore projects. The companies also have agreed to key terms for technology exchange, localization of production and contracts placement. Officials from the Port of Oakland, US Maritime Administration and Pacific Merchant Shipping Association and other agencies gathered Nov. 8 to mark the completion of construction of shoreside power infrastructure at the Port of Oakland. Shore power – the shore-to-ship connection that provides electrical power to the ship, thereby significantly reducing diesel and other air pollutant emissions from ships while they are at berth – is being implemented at the Port of Oakland in a two-phase, multi-year program covering 11 berths. The port has completed construction of the new electrical infrastructure system, with final testing of the system scheduled to be complete before the end of the year. The total cost for just the shoreside infrastructure was about $70 million, with the US Maritime Administration (MARAD) and the Bay Area Air Quality Management District (BAAQMD) contributed $12.8 million. “The Port of Oakland’s shore power project received federal funding through a very competitive TIGER grant process because this project is recognized as creating a valuable, sustainable, green trade corridor,” MARAD Associate Administrator Keith Lesnick said. An additional $20 million was awarded to the port by the California Air Resources Board (CARB) and the Metropolitan Transportation Commission (MTC)/Federal Highway Administration. In 2008, the California Air Resources Board adopted a directive to require reductions of air pollutants from ocean-going vessels. The rule, commonly referred to as the “shore power regulation,” requires that all operators of container, passenger and refrigerated cargo vessels that visit California ports more than 25 times a year employ an emission reduction system for their fleet by Jan. 1, 2014. The US Department of Transportation’s Maritime Administration (MARAD) announced Nov. 7 that it’s providing a total of $1.4 million for two projects supporting the increased use of alternative fuels and technology in the maritime industry. The funds are expected be used to collect information on the use of liquefied natural gas as a marine propulsion and to study the issues and challenges associated with shore side storage and fueling of LNG vessels. MARAD says it will provide Horizon Lines with $900,000 to assist in conversion and monitoring of its vessel, Horizon Spirit, to operate on LNG. The Horizon Spirit is an 892-foot long, 115-foot wide ocean going container ship that operates between Long Beach, California, and Honolulu. 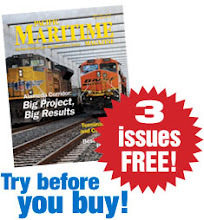 The conversion is anticipated to be completed by late 2015, according to MARAD. The second project is a $500,000 MARAD funded LNG study conducted by the US subsidiary of Norwegian technical standards development company Det Norske Veritas to analyze the issues and challenges associated with the process of supplying fuel for ships and the landside infrastructure needed to store and distribute LNG. MARAD says it anticipates the study will be complete by spring 2014. The two recipients were chosen via a competitive process to partner with MARAD as part of a new program to demonstrate innovative technologies and practices and share data on the results. “Fuel-efficient ships appeal to the maritime industry for the exact same reasons that fuel-efficient cars appeal to consumers – they’re easy on the environment and their pocketbooks,” US Transportation Secretary Anthony Foxx said in a statement. Los Angeles City Engineer and former engineering bureau general manager Gary Lee Moore has begun his duties as interim director of the Port of Los Angeles, taking over for retiring Executive Director Geraldine Knatz. Knatz was the port’s executive director for almost eight years before announcing in October that she was stepping down. In his decade-long tenure as city engineer for Los Angeles, Moore oversaw an annual operating budget of $149 million, according to the city. Prior to that, he was General Manager of the City of Los Angeles Bureau of Engineering, where he was responsible for the city’s public infrastructure network; his duties included the planning, design and construction of all public facilities. Moore’s first order of business will be a trip to Japan, where he will meet with Japanese customers and port officials.